Welcome to the 12 Days of Blogmas - Day 2! I start everyday with a Green Tea Latte and I can't imagine my morning without a nice cosy cup! I know I've written about my love for Green Tea Latte's on my blog before so I thought it was about time I shared my recipe. In my opinion this tastes just like the Green Tea Latte's you would get at Starbucks. The first thing you need is Matcha Powder. You can usually find this at health food stores. Matcha powder uses the whole green tea leaf which means it has 10 to 15 times the nutrients of traditional tea and 100 times more antioxidants. It also gives you lots of energy so it's a good alternative to coffee. 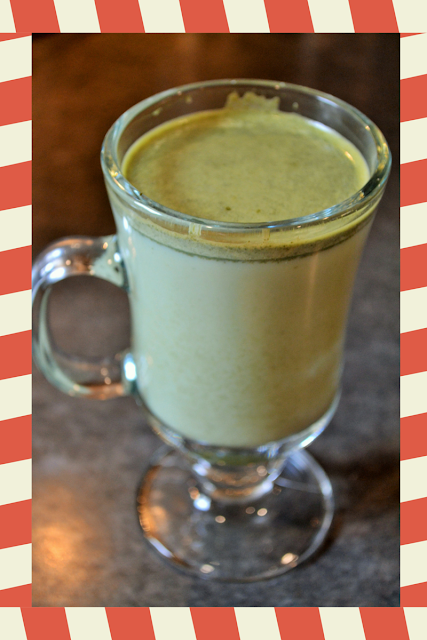 To make this delicious drink, take 2 teaspoons of matcha powder and dissolve it in hot water. If you take sugar in your tea add it now. I usually stop the water just before it starts boiling. You don't need a lot of water for this, just enough to dissolve all of the powder. Then fill the rest of your glass with milk. I usually use skim milk, but you can use whatever you have. You then need to heat the milk so put your drink in the microwave for about 2 minutes. You'll want to use a microwave safe glass or mug for this. If you have a milk frother and want to get fancy, that is also an alternative. Congrats you now have a delicious Starbucks Quality Green Tea Latte! If you try this recipe let me know how you like it!